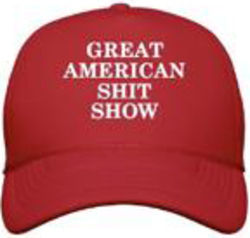 Solo performance legends Brian Copeland and Charlie Varon join forces to present new monologues on life in the Age of Trump in THE GREAT AMERICAN SH*T SHOW. The show will be presented Thursday, April 18 at The Marin Center’s Showcase Theater. Copeland and Varon are legends in the Bay Area’s solo performance scene. Brian Copeland is known for his hit solo shows Not a Genuine Black Man and The Waiting Period. Charlie Varon’s best-known works include Rush Limbaugh in Night School and Rabbi Sam. All of Copeland and Varon’s monologues in the SH*T SHOW were developed with and directed by noted solo performance director David Ford. Copeland and Varon have been performing the show once a month to sold-out houses at The Marsh, with material evolving as political events unfold. Brian Copeland has been in show business since age 18. Soon he was headlining comedy clubs and concerts across the country and opening for Smokey Robinson, The Temptations, Ringo Starr, and Aretha Franklin, in venues across the U.S. Then Copeland branched off into TV, appearing in comedy programs on NBC, A&E and MTV. He spent five years as co-host of SF FOX affiliate KTVU program Mornings on 2 and two-years hosting SF ABC affiliate KGO’s Emmy Award winning afternoon talker 7Live. (who later premiered THE BRIAN COPELAND SHOW). Copeland moved into theatre in 2004 with his first solo play, NOT A GENUINE BLACK MAN. This critically acclaimed exploration of race and identity created an audience-pleasing blend of laughter, tears and sociology that led to the show becoming the longest running solo play in SF theatrical history. Successful runs in LA and Off Broadway and a bestselling book adaptation followed. The San Francisco Chronicle has credited Charlie Varon with “redefining the art form of solo performance.” Varon has been an artist-in-residence at The Marsh Theater in San Francisco since 1991. His award-winning hit shows – all created in collaboration with David Ford –include RUSH LIMBAUGH IN NIGHT SCHOOL (1994), THE PEOPLE’S VIOLIN (2000), and RABBI SAM (2009). Varon has also directed and collaborated with Dan Hoyle on his numerous hit solo shows, including TINGS DEY HAPPEN, THE REAL AMERICANS and the current BORDER PEOPLE. David Ford (collaborator and director) is the one of the nation’s leading directors of solo theater. He has collaborated with Charlie Varon for 28 years, with Brian Copeland for 15 years, and with dozens of other performers, including Geoff Hoyle, Marilyn Pittman and Echo Brown.